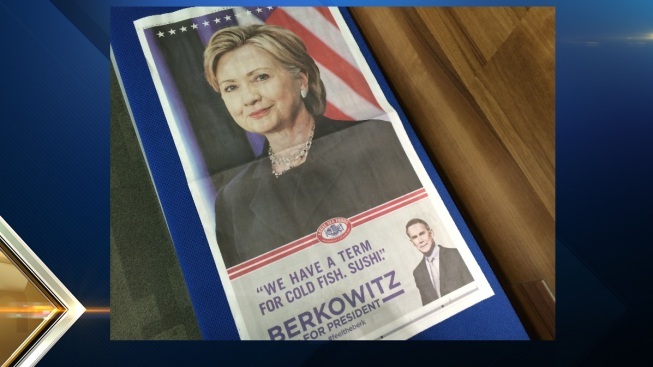 The full-page ad features a large picture of the Democratic presidential candidate with text reading "We have a term for cold fish. Sushi." Legal Sea Foods founder Roger Berkowitz is taking some heat for a Hillary Clinton-themed ad that appeared in the Boston Globe and the Boston Herald on Monday. The full-page ad features a large picture of Clinton, with text underneath that reads "We have a term for cold fish. Sushi." The ad includes a photo of Berkowitz with a fake presidential campaign slogan "Berkowitz for President. #feeltheberk," a play on Democratic presidential candidate Bernie Sanders' "Feel the Bern" slogan. Many people took to Twitter on Monday to blast the ad, calling it "offensive," "misogynistic" and "sexist." Some people also asked Berkowitz - who is also the company's president and CEO - to issue an apology. "She has a lot more to offer than that," said Clinton supporter, Tristanne Spotsswood. "That's just some jealousy and the underrating value that she can offer." #feeltheberk as a customer who eats at Legal's weekly I find this morning's sexist ad grossly offensive. What could you be thinking? Legal Sea Foods has been running a series of ads using the campaign theme for several months now. The company is known for its tongue-in-cheek approach to advertising. Other female customers had mixed reviews. "I don't know if it bothers me as a women," said customer Jennifer Dinkel. "I think it's definitely gendered in its portrayal. I mean, you may or may not like Hillary Clinton but I think a cold fish is a sexist term you have to be careful of the use of." The Boston-based chain has more than 30 restaurants across the U.S., including 24 in Massachusetts and one in Rhode Island. The CEO of Legal Sea Foods told necn in no way was the ad meant to further a political agenda. The company also recently placed an ad in the Boston Globe taking a swipe at Donald Trump. "The term cold fish applies to both men and women," said Berkowitz. "To read something that's not there into it and get so bent out of shape with a knee-jerk reaction is a bit puzzling to me."